Day 7 of the 25th session of the Human Rights Council continued apace, with interactive dialogue (ID) with the Special Rapporteurs (SRs) on the rights to food and adequate housing, which began on Day 6. At the end of the clamorous ID, two UN independent experts - the first on the issues of human rights, obligations relating to the enjoyment of a safe, clean, healthy and sustainable environment, and the second on the effects of foreign debt and other related international financial obligations - presented their opening remarks. These were followed by the ID with member states, NHRIs and NGOs. The often complementar y relationship between Human Rights and environmental issues was one of the main discussion themes during the clustered ID. The United States highlighted the absence of human rights obligations specific to the environment in any globally applicable, binding instrument or as a matter of customary international law. The EU also noted its active involvement in the protection of the environment through codifying a set of legislation, monitoring and implementation. On behalf of the African Group, Ethiopia expressed its deep concerns over alarming outflows of illicit funds from developing to developed countries. Subsequent clustered interactive dialogues with SR on freedom of religion or belief and SR on the promotion and protection of human rights and fundamental freedoms while countering terrorism started with their opening remarks. SR on freedom of religion said, “ Manifestations of collective hatred poison the relationship between communities, threaten individuals and groups and are a source of innumerable human rights violations perpetrated by State agencies and/or non-State actors”. 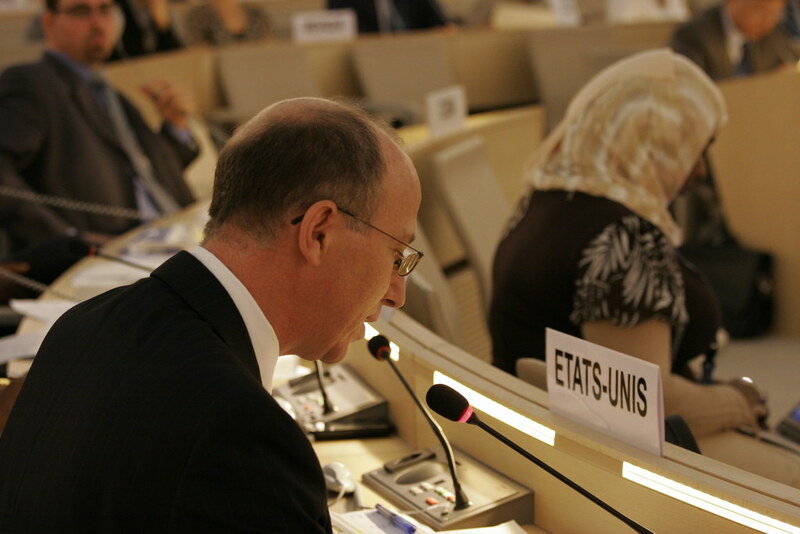 OHCHR report on Sri Lanka to the Human Rights Council says that “the High Commissioner remains deeply disturbed by the significant surge in attacks against religious minorities and the incitement of violence by Sinhala Buddhist nationalist groups, led predominantly by certain extremist Buddhist monks”. Opening remarks of Special Rapporteur on the promotion and protection of human rights and fundamental freedoms while countering terrorism focused on his last inquiry report on the use of armed drones in counter terrorism operations. Evening meeting of the session begun with the panel discussion on the importance of the promotion and protection of civil society space which was chaired by H.E. Mr. Baudelaire Ndong Ella, President of the Human Rights Council and moderated by Ms. Hina Jilani, prominent human rights lawyer and pro-democracy campaigner. The Secretary-General of the United Nations gave his presentation via video message.